The Adumari Blades were designed on the remote planet of Adumar, for use in defending the planet from outsiders. Wedge, Hobbie, Janson, and Tycho visited the planet in hopes of gaining use of their munitions productions facilities, and while there tested out the local fighters. Though lacking shields or a hyperdrive, these craft can certainly take more of a beating than most ships due to the strength of their hulls. They are well put-together craft, though they suffer from sluggish maneuverability not unlike the Y-Wing. Additionally, they boast a pair of rear-firing lasers, allowing a pilot being pursued by an enemy craft to defend its rear as well as going through maneuvers. They can also carry a payload of 10 missiles, as opposed to the standard of 6-8 missiles, which gives them extended usefulness in prolonged combat. Their internal systems are drastically different from those of most New Republic and Imperial ships, making adjusting to the new ship style difficult for most pilots. 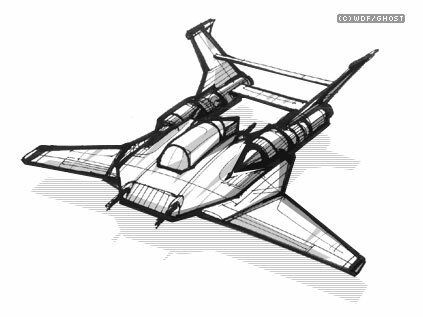 Colonel Celchu speculated that by adding a hyperdrive and shields, though losing speed and maneuverability, the craft could become a fine dedicated bomber or anti-capital ship craft for the New Republic, though this theory went untested by Republic engineers. Craft: Tarrvin-on-Kallik Blade-32 Starfighter; Class: Starfighter; Cost: 55,000 (new), 25,000 (used); Size: Tiny (12.6m length); Initiative: +4 (+2 crew, +2 size); Crew: 1; Passengers: 0; Cargo Capacity: 65 kilograms; Consumables: 2 Days; Hyperdrive: None; Maximum Speed: Ramming (7 spaces); Maneuvers: +3 (+2 size, +2 crew, -1 engine quality); Defense: 22 (+2 size, +10 armor); Hull Points: 150; Shield Points: 0; DR: 10. Weapon: Laser Cannon (2 fire-linked) x2; Fire Arc: 1 Pair Front, 1 Pair Back; Attack Bonus: +6 (+2 size, +2 crew, +2 fire control); Damage: 5d10x2; Range Modifiers: PB +0, S -2, M/L N/A. Weapon: Concussion Missile Launcher x2; Fire Arc: Front; Attack Bonus: +6 (+2 size, +2 crew, +2 fire control); Damage: 8d10x2; Range Modifiers: PB +0, S/M/L N/A.